DRM-X 4.0 supports Microsoft Windows and Apple MacOS systems on the computer. DRM Digital Rights Management Protect Content PDF, Protect MP4, Protect WebM, Protect MP3, Protect WAV, Protect html. DRM-X 4.0 supports Microsoft Windows and Apple MacOS systems on the computer. With DRM-X 4.0, you can easily transfer encrypted files between Windows PCs, tablets, and Macs, and play or read them online. This ensures that your files provide users with high-quality enjoyment while ensuring that the content Copyright is not infringed, it also greatly expands the market space. Xvast supports Window 7, Window 8, and Window 10 systems. 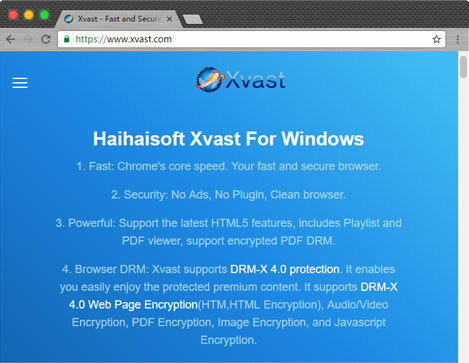 In Xvast, it supports online playback and offline playback, read PDF online and offline, supports open an encrypted webpage online and open encrypted webpage content offline. Xvast browser support MacOS Mavericks (10.9 or later, 64-bit CPU). 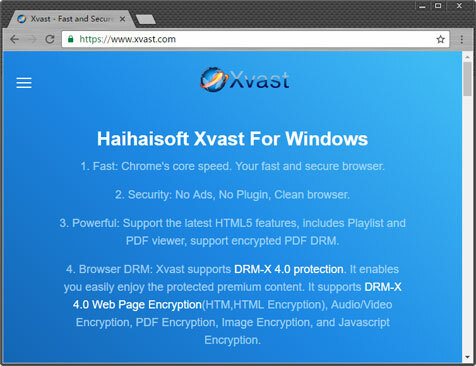 Xvast browser is based-on latest Chrome core. It provides extremely fast browsing for protected content, with the same user experience on MacOS as on Windows.